Although I’m not usually one to wear much black, I couldn’t ignore the potential of this dress when I found it at Vinnies recently for around $8. Even though it pretty much looked like a nun’s habit. There was no fabric label on it but it looked and felt like wool jersey to me as despite obviously having been worn a fair bit, there was no pilling such as inevitably happens to material with synthetic content. It is super difficult for me to resist any good quality natural material even if the garment itself looks so unflattering. So I bought it and did my usual tweaking, in this case taking the dress in along the side seams. 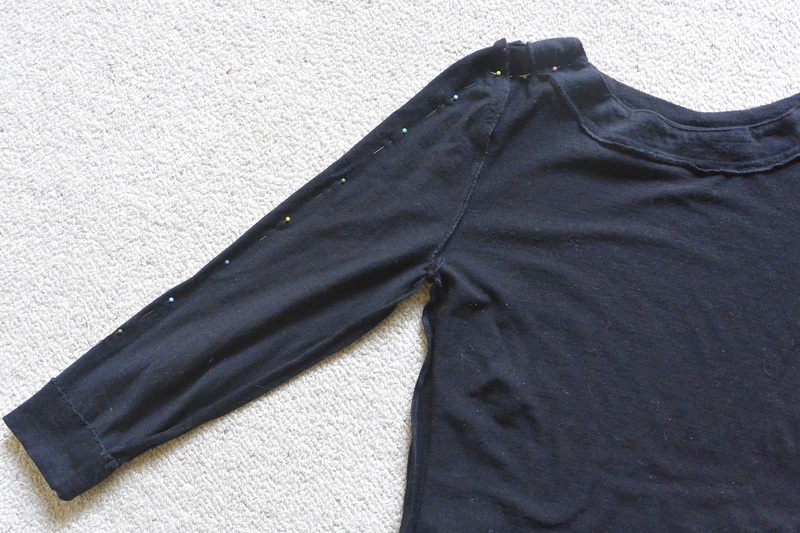 Don’t tell all the proper seamstresses, but instead of unpicking the sleeves around the armholes to create a more snug and flattering fit, I just sewed along the shoulder seams and down the sleeves pretty much as per the pins in this photo. Tut tut!!! In my defence, at least I unpicked the neck facing when I was taking in the shoulder seams, which you can’t see in this photo. It turns out there’s a reason that a black dress is so often on “wardrobe must haves” lists: it’s pretty much a blank canvas for accessorising. Here are just three looks I put together today with minimal effort (ie I just grabbed what was lying on my floordrobe, pretty much). 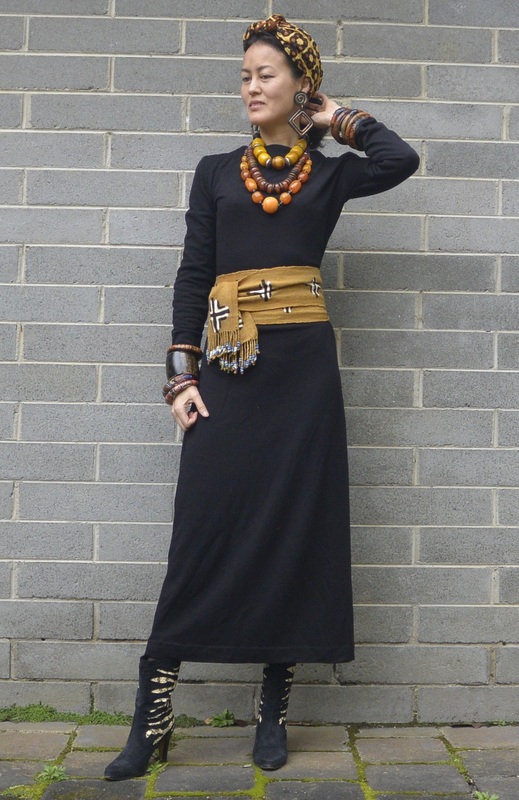 All the accessories in this look are from opshops or fleamarkets except for the mud dyed African textile around my waist, which I bought in Tokyo (of all places). Sticking with the “interesting textiles” theme (which I tend to do most of the time as you would know!) 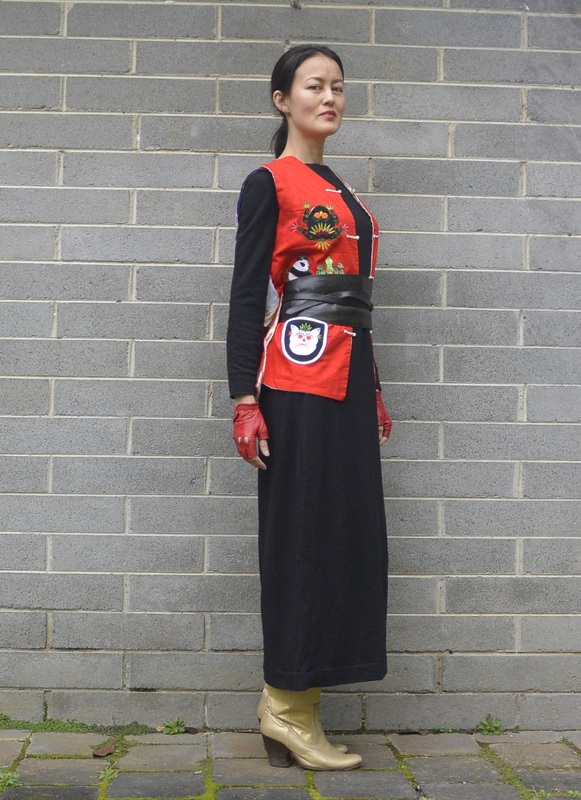 I tried the dress with this Chinese vest and fingerless leather gloves which I don’t think have made an appearance on this blog yet, a situation which I thought was long overdue for remedying. I get quite a lot of wear from this black leather wraparound belt which is by Jaeger and was, naturally, from an opshop. Actually, only the gold boots in this outfit were new, but that was more than a decade ago as I bought them at a sample sale when I was still working in Tokyo. Last but not least, possibly the most minimal styling I have ever done, with only a crocheted turban and matching red socks to jazz up my Etiko sneakers. I wouldn’t have thought I could wear something so understated but I actually quite like this look, not that I have sported it out in public yet. It’s so minimal it would kind of feel like I’m in disguise, but it’s also a useful outfit to keep in mind for when I have “nothing to wear” and am in a super hurry. Anyway, I’m sure I’ll find heaps more ways to wear this dress. I’ll try to get in the habit of trying out new styles. Ha. It definitely provides a great base for some stunning colour!